I am about to enter into a new phase in my life, retirement. This is a time of ambivalence. I am looking forward to more freedom and yet feel a sadness of leaving the profession I be been devoted to. Emptying file cabinets and bookshelves was like experiencing a time capsule of my career. 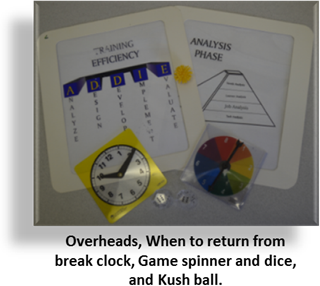 I found antiques like overheads, number spinners, manual clocks and dice used to facilitate games designed to withstand the heat generated by an overhead projector, hundreds of articles (now scanned into digital form) and copies of the various articles I have written; some published and some rejected. I found it curious how the value of items has varied over time. It reminded me of the importance of keeping in mind the “Hype” curve as trends such as mobile-learning, social-learning, and gamification will and have come and gone. This is even more important in our world of rapidly evolving technology. It is my belief we humans change at much slower pace. Therefore, we as instructional designers always need to remember technology is our tool not master. The packing process also reminded me of the wonderful depth and breadth of our profession. How it could be possible to spend an entire career in one of the major theory bases that is a part of the field of instructional systems design, and then, maybe never make a significant contribution. (Refer back to the last post on the ISD InfoGraphic). I reflected on of the many times I would feel an inclination of confidence just slightly above the subliminal level and a new challenge would emerge. For example: How are you skills in designing or implementing “propaedeutics”? Yep propaedeutics! I was first introduced to the term when reading an article by Marilyn Garber on The Dialogic Classroom: Strategies of Discussion in the Humanities which I discovered, again, while packing. The term means “pertaining to or the nature of preliminary instruction” (1). As I continued down this rabbit hole I discovered: advanced organizers, WWIIFM, YCDI, scaffolding, effectiveness grids, formative evaluations, how to share objectives effectively, enhancing adult motivation to learn, group think and group dynamics, and the pre attentive perceptual processing related to instructional message design; just to scratch the surface. “Instructional design assumes that instructional interventions result in learning outcomes, and that the correct sequence of instructional interventions or events will make learning more efficient.” Jonassen & Harris. “We can only transmit verbal and pictorial symbols from which you construct your own meanings. The most we can hope for is that our messages are in such a manner that your skills and knowledge can be used to decode and interpret them as closely as possible in the way we intended” Heinich. “If the course or training is required, then the motivational goal of instructional design is to make this learning worthy of the adult learner’s choice – to help that person eventually to think “I may not have wanted this to being with, but I do want it now.”” Raymond J. Wlodkowski. I’m not sure of when my next blog post will be, or if this is my last one. If it is my last, there could not be a better way to close then by sharing the above. Thank you to all of you who have guided me on my journey and especially to those of you who have challenged me with constructive comments and criticisms. Success in all you endeavors. CJ, I wonder how you are applying your instructional skills to your retirement, or if you really stayed retired? Do you still record your musings on learning and memory?